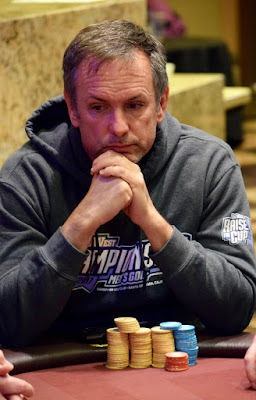 All in as the short stack, Cy Williams draws a call from chipleader Eyyal Altar and Shawn Roberts. The flop is all clubs, turn and river are blanks, and up go the cards. Pocket Tens for Altar, Ace_Eight for Roberts and the sidepot goes to the chipleader. Williams shows King_Ten of Clubs .. a flopped flush that is good for a triple. Nine remain in today's $30,000 Guaranteed $345.